Adama Dieng, Under-Secretary-General and Special Adviser of the UN Secretary-General on the Prevention of Genocide, said it was “very worrying” to see an increase in hate speech in western countries. 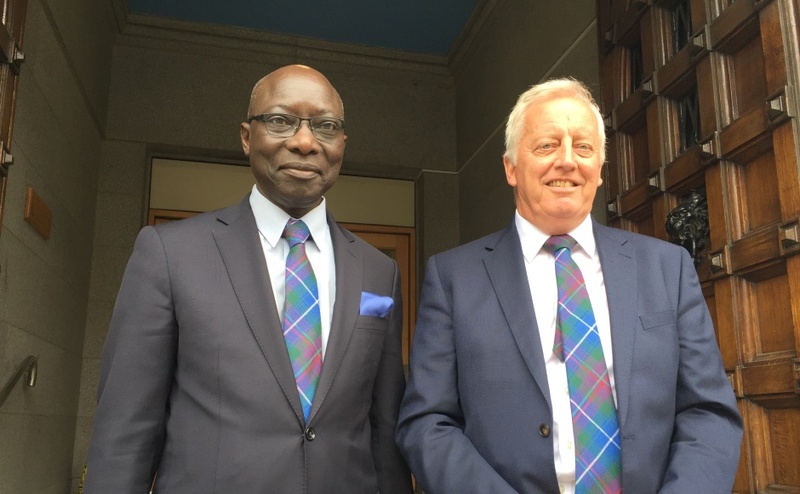 United Nations official Adama Dieng was presented with a Church of Scotland tartan tie as a gift after his visit to the church offices in Edinburgh. With Rev Dr George Whyte. He made the remarks at the Scottish Parliament yesterday as he unveiled a new UN action plan on the prevention of genocide. It is targeted at religious leaders and focuses on three themes – prevent, strengthen and build. Mr Dieng said First Minister Nicola Sturgeon, whom he met with yesterday, has welcomed the action plan. It is the result of two years of consultations with leaders from different faiths and religions around the world. Discussions at the Scottish Parliament. L-R, Dr Aliakbar Jafari, Adama Dieng and Imam Sayed Razawi, Director-General of the Scottish Ahlul Bayt Society. It includes a broad range of suggestions for ways in which religious leaders and others can prevent incitement to violence and contribute to peace and stability. All religions teach respect for life and recognise human beings as fundamentally equal. The right to free speech is protected under international law but speech that constitutes incitement to violence is prohibited. The action plan notes that social media is increasingly being used to spread hostility and encourage people to commit violence against specific communities, often based on their identity. 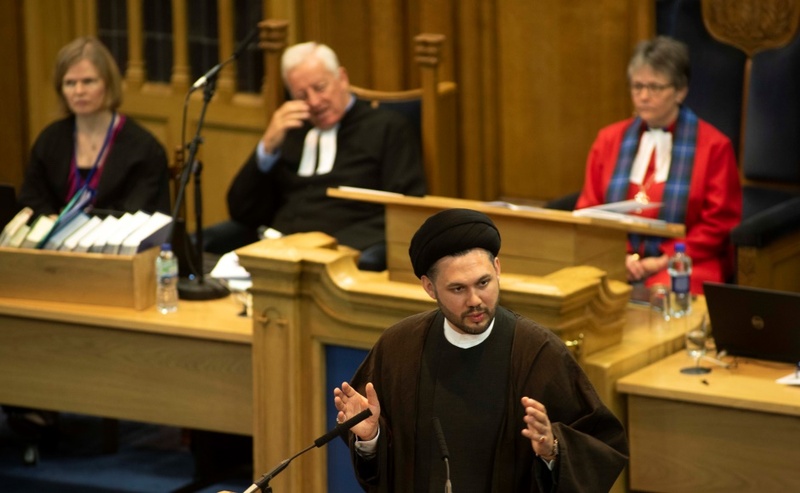 The interfaith event was organised by the Scottish Ahlul Bayt Society, which represents the Shia Muslim community, with support from the Church of Scotland. L-R Rev Dr George Whyte, Imam Sayed Razawi, , Very Reverend Professor Iain Torrance and Shabir Beg of the Scottish Ahlul Bayt Society. Mr Dieng said “We are witnessing a world that is in turmoil, there are so many tensions. “Regrettably, hate speech is more widespread in many societies where the unknown and the different are marginalised and demonised. Mr Dieng lamented the fact that genocides have still taken place – Rwanda and Bosnia - since the Holocaust in the 1940s, despite the international cry of “never again”. He said there was not a single country on earth that was immune to genocide. 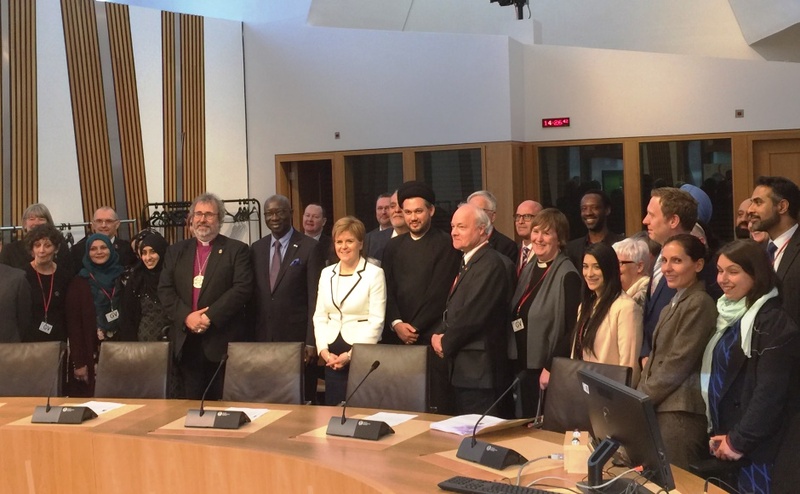 First Minister Nicola Sturgeon welcomes faith leaders to the Scottish Parliament. Mr Dieng said: “There is no doubt that genocide is a process, it does not happen over night. The UN says religious leaders can play a particularly important role in influencing the behaviour of people who share their beliefs. It noted, however, that religion has sometimes been misused to justify incitement to violence and discrimination. 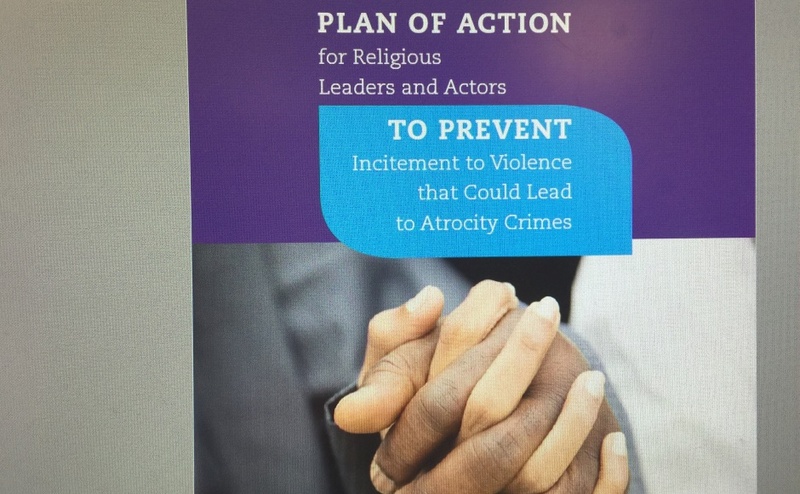 The action plan says it is “vital” that religious leaders from all faiths show leadership. 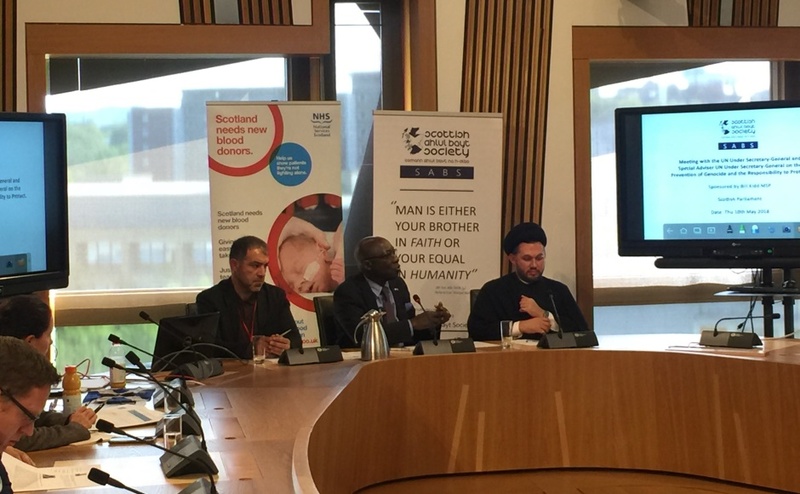 Imam Sayed Razawi, Director-General of the Scottish Ahlul Bayt Society, said he was pleased Mr Dieng’s visit presented an opportunity for people of faith and no faith to discuss ways of healing through reconciliation and trust building. “There are problems being faced by communities across the world and we need to start walking shoulder to shoulder,” he said. “When we walk together, it has a great impact. “Let us make the ‘other’s cause’ our cause, it is very powerful. “For example, when I see problems facing Christian minorities in Pakistan and Egypt, I stand up and say we support them. 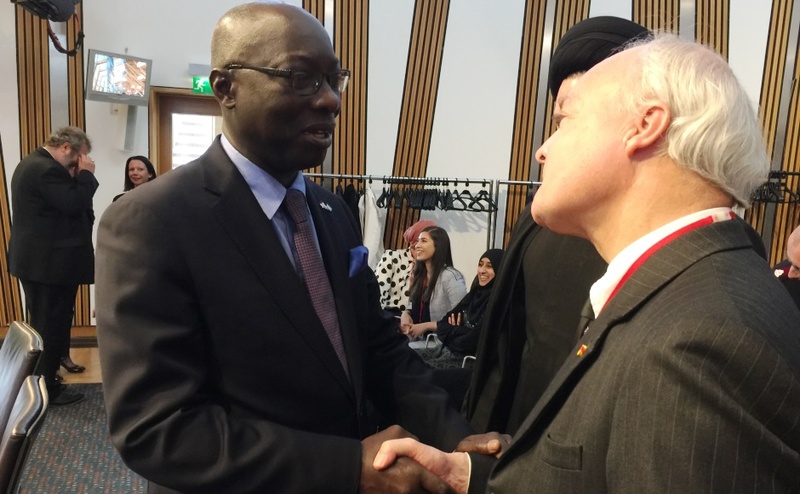 Adama Dieng, Under-Secretary-General and Special Adviser of the UN Secretary-General on the Prevention of Genocide, meets Very Reverend Professor Iain Torrance at the Scottish Parliament. Church of Scotland minister and University of Aberdeen Pro-Chancellor, Very Reverend Professor Iain Torrance, attended the seminar. He pointed out that after the bitter divisions of the War of the Three Kingdoms in Britain, a stable settlement was not found from any of the religious protagonists, but from Enlightenment philosopher, John Locke. Professor Torrance said he put forward the idea of secular toleration and limited claims. “John Locke suggested that we needed to recover civil institutions which preserved limited difference,” added the minister. Rev Dr George Whyte, Principal Clerk of the General Assembly of the Church of Scotland, said he was pleased to attend the seminar and host Mr Dieng at the church offices on Wednesday. 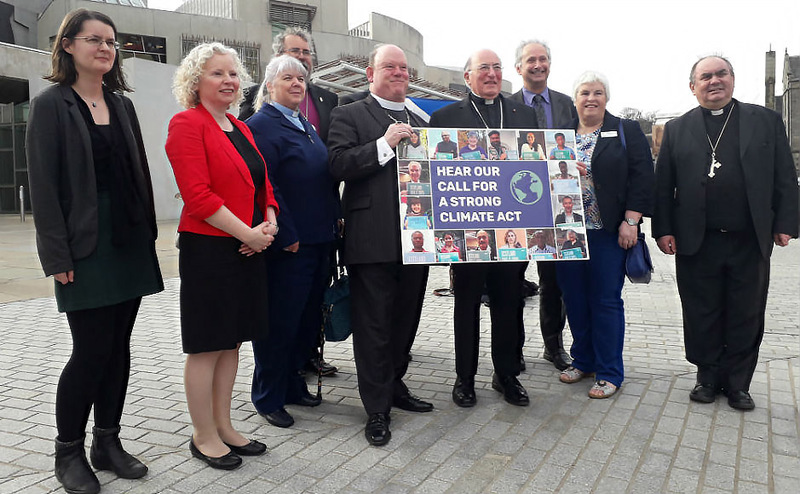 “Genocide may seem far removed from Scotland but conflicts can happen anywhere when people don’t know and understand their neighbours,” added the minister. The seminar was sponsored by Bill Kidd, MSP for Glasgow Anniesland. Guest speakers included Dr Aliakbar Jafari of Strathclyde University in Glasgow and Mary Morgan, Director of the Scottish National Blood Transfusion Service. She explained why blood donations can help aid reconciliation.